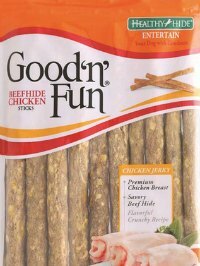 Salix Animal Health of Deerfield, Fla. is expanding its recall of Good ‘n’ Fun – Beefhide Chicken Sticks dog treats for Salmonella. Consumers who purchase this brand of dog treats should check for the UPC code 091093822471 and expiration dates ranging from 02/2018- 07/2018. These treats should not be given to dogs as they may cause illness. Salmonella in pet treat can cause illness in pets that eat them or humans who handle them. Symptoms of a Salmonella infection in humans include nausea, vomiting, diarrhea or bloody diarrhea, abdominal cramping and fever. Salmonella infections can also trigger long-term ailments, including heart problems, arthritis, muscle pain, eye irritation, and urinary tract symptoms. Consumers exhibiting these signs after having contact with this product should contact their healthcare providers. Dogs with Salmonella infections may be lethargic and have diarrhea or bloody diarrhea, fever, and vomiting. Some may have decreased appetite, fever and abdominal pain. If your pet has consumed the recalled product and has these symptoms, please contact your veterinarian. The recalled treats were distributed nationwide to Dollar General, Dollar Tree and Family Dollar retail stores. They were sold in 2.8 ounce bag stamped on the back side with an item code number of 82247.